The thirteen hero ships in this series by The History Channel share certain characteristics. All are American. Most fought in World War II. Almost all of the featured ships survived to become ship museums, allowing this series to include film shots of the actual ships. These include destroyer USS Laffey, battleship USS New Jersey, aircraft carrier USS Yorktown, LST-325 (Landing Ship Tank), frigate USS Constitution, Liberty ship USS Jeremiah O'Brien, submarine USS Nautilus, aircraft carrier USS Hornet, battleship USS Arizona, and battleship USS Texas. Many ships had two or more ships with the same name, so episodes will often cover the history of more than one ship in detail or at least mention briefly the other ships with the same name. They generally distinguished themselves in battle, although it is difficult to compare them to the heroism of other ships not included in the series. Some like the battleship Arizona did little fighting and ended up sinking, so heroism cannot be equated always with success in battle. 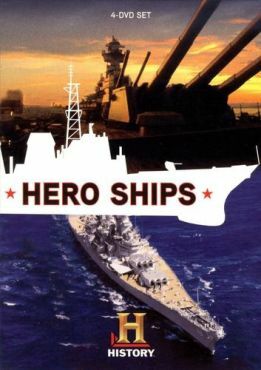 Some episodes, especially the ones about LST-325 (Landing Ship Tank) and Liberty ship USS Jeremiah O'Brien, seem to cover all the ships in the class of ships rather than just the specific one in the title. The interview clips with surviving veterans of these hero ships provide the highlights of the documentary's episodes, but most of these do not last long. The accompanying film clips often seem to come from stock footage that has no direct relationship to the ship's history being told. The shows need more maps so that viewers can better understand battles. The sprawling histories of often multiple ships in one episode at times lack focus. The USS Constitution episode provides an example of this with the concentration on the US Navy's annual teambuilding training exercise for selected Chief Petty Officers aboard the over 200-year-old ship. Although an interesting story, the episode would not lose anything if edited down to half the time. Specific dates are often missing with only general references to the time periods of events. The episode on USS Laffey suffers the same weaknesses as the entire series. The destroyer USS Laffey (DD-724) earned the nickname of "the ship that would not die" when she fought off 22 Japanese planes that attacked the ship on April 16, 1945. The destroyer had been assigned to Radar Picket Station No. 1, the closest one to mainland Japan, in order to detect kamikaze planes and to protect the American fleet around Okinawa. Laffey did not sink despite seven hits by kamikaze planes and four hits by bombs (some sources differ based on how near hits were counted) with casualties of one third of the crew (32 dead and over 70 wounded). The crewmembers fought for 80 minutes, and the attack finally ended soon after Combat Air Patrol (CAP) planes arrived. Three Laffey crewmen who survived the attack (quartermaster Ari Phoutrides, gunner's mate Lawrence Delewski, and machinist mate Jim Spriggs) give vivid and emotional comments about the kamikaze attack by so many planes. Phoutrides explains that during the attack Captain Becton said, "I will never abandon ship as long as I have a gun to fire." Although the veterans' comments give life to this documentary episode, it has little of the excitement generated by the computerized graphics in the Dogfights presentation of the kamikaze attack on USS Laffey. The Hero Ships show on USS Laffey devotes about half of the time to the first destroyer named USS Laffey (DD-459), which sank in the Naval Battle of Guadalcanal on November 13, 1942. The episode also covers the fighting of USS Laffey (DD-724) during the Battle of Ormoc Bay in the Philippines where there were 30 kamikaze attacks during ten hours on December 7, 1944. Kamikaze attacks get mentioned in some other episodes. Off Okinawa a kamikaze plane grazed battleship USS New York (BB-34) and crashed just off the side. A New York veteran says that the plane had both wings clipped off when it hit the ship's topside with nobody killed but 20 or 30 men injured. If the plane had been six feet to the right or left, the plane's fuselage with a bomb would have hit the ship and caused serious damage and more casualties. The documentary does not provide the date, but this attack on New York took place on April 14, 1945, and Navy records indicate two men were wounded in the explosion off the side of the ship . A battleship Texas (BB-35) veteran says that a kamikaze plane never hit the ship, but two crashed close to the ship, with one so close that pieces of the plane flew onto the ship. A veteran from aircraft carrier Hornet (CV-12) explains that kamikaze planes came close but never hit the ship. He expresses his thanks to the Combat Air Patrol (CAP) planes that prevented kamikazes from approaching. Hornet ended World War II without ever being hit by a bomb, torpedo, or kamikaze aircraft. A couple of episodes lack any mention of kamikaze attacks even though they played a critical role in the ship's history. On May 14, 1945, a Zero fighter carrying a bomb hit the aircraft carrier Enterprise (CV-6). The kamikaze attack killed 13, wounded 68, and knocked the ship out of the war, but the show on USS Enterprise does not mention it. The episode on LST-325 has an extended history of LST deployment in the European Theater, and the narrator incorrectly explains that the LST did not reach the Pacific until Japan surrendered. Actually, many LSTs saw service during the Pacific War. Five LSTs were sunk in aerial kamikaze attacks, and an additional twelve LSTs were hit by kamikaze planes . 1. Rielly 2010, 235, 322. 2. 47 Ships Sunk by Kamikaze Aircraft; Rielly 2010, 318-24.